These 6-ingredient peanut butter protein balls only take a few minutes to throw together and are full of healthful ingredients! Naturally gluten-free, whole grain, dairy-free and with a vegan option. With a how-to recipe video. There’s been enough savory food around here recently. It’s time to get back to sweet treats! I figured I wouldn’t go all out with a super decadent dessert being as the holidays just passed so here’s a healthy snack. By the way, who else loves peanut butter + honey?! It’s one of my favorite combinations. If you love it too, try these peanut butter chickpea cookies! I swear you can’t taste the chickpeas (which I actually hate!). All you do is dump the ingredients into a bowl and roll the mixture into balls. It’s not an especially sticky mixture so you’ll have to squeeze them together to get the balls to hold together. Prefer something more cookie-like? Try these no-bake oatmeal cookies! They’re also 100% whole grain and naturally gluten-free + vegan. And seriously – they’re one of my favorite recipe! I’ve made these peanut butter protein balls a number of times with the exact same ingredients (as in from the same package) and the very small amount of water I needed to add to hold the mixture together varied each time (hence the range in the measurement given). I also discovered that instead of using additional water to bring together the mixture, vanilla extract’s a tasty alternative! Make sure to use the kind of peanut butter that just contains peanuts and salt. If you use a brand that has added fat and sugar, these peanut butter balls likely won’t turn out well. You’d also be adding a ton of fat (and probably not the healthy kind) and sugar! Wondering how to make peanut butter? All you need is 1 ingredient and a food processor! Check out the video to see how easy it is. I haven’t tried today’s peanut butter balls with any other nut butters and they’re not always 100% interchangeable so I can’t say for sure if other types would work in these protein bites. In a medium mixing bowl, stir together the peanut butter, brown rice syrup or honey and vanilla extract. Stir in the oats, coconut and salt until well combined and then add the chocolate chips. If the mixture doesn’t hold together well when pinched together, add the additional water or vanilla, a teaspoon at a time until the mixture holds together well when pinched. Form 1” balls by pressing about 1 tablespoon of the mixture together. Store at room temperature for up to 3 days or refrigerate for 1 week. 197 comments on “Peanut Butter Protein Balls (gluten-free, vegan, whole grain, dairy-free)” — Add one! Love them! What is the nutritional value of one? Calories? This is such a great snack! I made a batch today and made it with almond butter instead of peanut butter and it came out so amazing. Great recipe and can’t wait to keep making this one! Yay! I’m so glad to hear that. :) Thanks for your comment! Erin, thank you for sharing this! I have made this so many times. Everyone that tries it, loves it! I crew on sail boats and I made these one day for a race. At first no one was really interested in them. I thought wow I got all these balls I have to bring back home. After a couple of hrs, my container was handed back to me empty. They were asking were there any more left? haha. New snack for the crew!! I love this recipe and my roommates are now obsessed with them. So I have to make them weekly. Haha. I’m glad that they’re obsessed. :) Thanks for your comment! Erin, this looks wonderful! I’ll try it today. Thank you for sharing! Great recipe. You know, I really like it when in the beginning there is a small Preface and most importantly – a photo of the finished dish. When I saw what was going to happen, I immediately said to myself – “Lisa, you will do it!”. To be honest, I did it the second time, but look like the photo you have. Was lucky to order all integritty in one place! Erin, what a gorgeous peanut butter protein balls! Your directions make this seem like such an easy approach, too. I would love to make this soon! Thanks a bunch. :) I hope you’ll like them as much as we did! Erin, what a gorgeous idea! We absolutely love protein balls! Definitely need to try these! Hello Erin, awesome protein balls :) thanks for sharing. 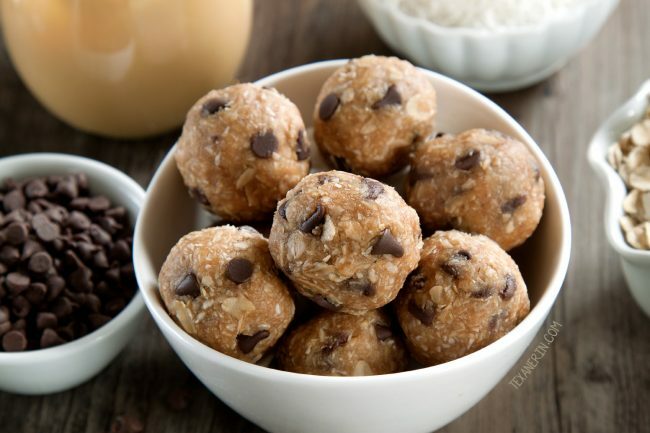 Hey there, I’m a huge fan of peanut butter and this peanut butter protein ballslook way awesome! Hello! Thank you very much. :) I’m happy you enjoyed them! Can you substitute the PB with anything else? My daughter is allergic to peanuts – I use to enjoy these very much before having her. How much protein is in ball? Do we have to wait a week until we can eat them? Nope. You can store at room temperature for up to 3 days or refrigerate for up to 1 week. Thank you so much for a great recipe. I made these yesterday and they were super easy and tasty. what is the calorie, fat, protein and carb count in the original recipe? I calculated the calories of the ingredients listed and found that the calories per piece would be around 115. Can these be made with powdered peanut butter, such as PB2? I’ve never tried it so I really can’t say. Sorry about that! How many balls do you think is a serving size? They are Delicious thank you for this recipe!! I love this recipe! I really appreciate having the weight listed too as cups confuse me and put me off using a recipe. I add a scoop of vanilla protein powder too and eat one with some fruit when I need a snack after work before I go to the gym. Hi Tracey from the UK! :) Raisins and cranberries sound like great additions. I love that you pack your daughter one of these instead of a dessert! I hope she enjoys her not super sweet treats. Thanks a bunch for your feedback! Any idea of calorie content on these? Pam did you ever find out the calorie content? I got a really hIgh number. 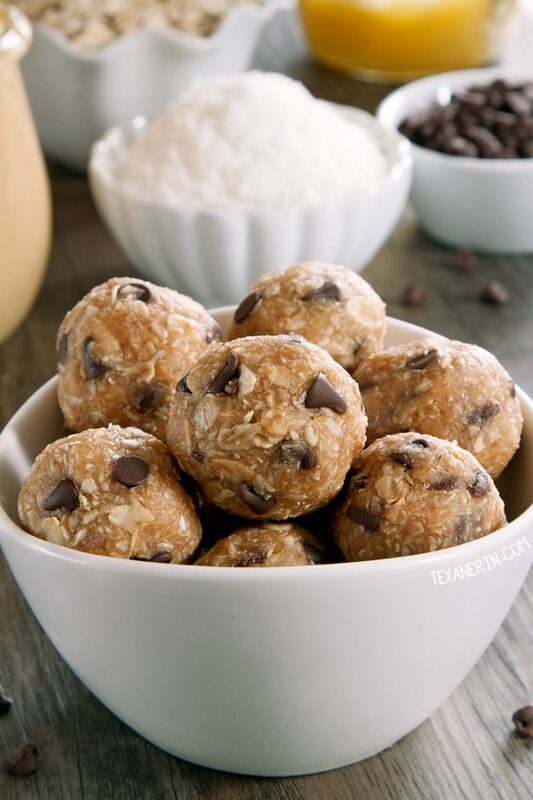 These peanut butter protein balls look absolutely fantastic. Beautiful photos, too. I look forward to trying this. I was wondering if you could substitute maple syrup for the honey. Any thoughts? I can’t wait to try these. What a perfect summertime snack! What can you substitute for coconut? (lot of fat in coconut) Can handle the peanut butter and chocolate chips but would love a lighter fat sub for the coconut. So glad to hear there is a substitute for coconut. I have a tree nut allergy and was trying to think of something with a consistency similar to coconut that is still super tasty. Do you have any other suggestions than more oats? I might sprinkle some (well more than some for sure!) cinnamon into part of a batch. I love cinnamon! Would this recipe still work if the oatmeal was replaced with almond flour? The two aren’t interchangeable but you could mix everything except for the chocolate chips together and then add almond flour until it comes together. I’d love to hear how it goes! Has anyone froze these? How well do they freeze and what’s the best length of time? Thanks. I’ve frozen them and it works well! What do you mean by best length of time? Like how long? I didn’t freeze them for super long but I’m guessing a few weeks would be fine. These are delicious! I ate two and satisfied my sweet tooth. One probably would have done it, but I just couldn’t help myself. So easy! Haha. Two is still very reasonable. :) Thanks a bunch for your comment! Just made these and they are delicious! And nutritional value wise, I’m sure they aren’t even that bad! Yum! Awesome recipe! I love it!